You can still download some audio and light measuring tools, and experiment and practice with them until you can use them easily in a dark room. Audio Tools for the iPhone – There are many…too many, in fact. Some are extremely significant professional tools at great cost – not knocking them, since they are reasonable if you are a pro who needs the complexity. Some are too simple or have pop-ups that will annoy you in the dark room. Some need several taps on the screen to set it up the way you need it for the auditorium measurement. We recommend one that is not only free, but it is quick and simple to get good data from. What we need is something that quickly tells us 2 numbers. The first number is called Peak, which measures the sharp blast of energy that a clap of lightning or a single hand clap might have. The other number – the one we actually need most often – takes an average of all the sounds for a particular segment of time…a moving window of time, in fact. The name goes by the abbreviation of “RMS”, which stands for a technical term that sounds like a rapper’s name on a science cartoon: Root Mean Square. If you are thinking it sounds like math and Must. Be. Ignored., you are right! Many of the tools will have a Peak and RMS number displayed quickly and at the same time. This is what you want. You can skip the Peak level, but it is good to be familiar with it. Usually, we will just report the RMS level. But there is another layer of complexity. There are choices in how we measure RMS levels. The first choice is Fast or Slow. The second choice is A or B or C or Z weighting. We can study why in another lesson. Engineers talk for hours about these things. A very simple and clean interface gives all the details you need. And, most important, you can change the weighting and response speed from the front panel. dB volume is a nice tool, with easiest access to the variables that you need to change. People may tell you that the iPhone isn’t exact, or argue that you need something more precise. But both of those statements are not true. We need something consistent. We measure today, we measure tomorrow. If the sound level is the same, the measurement should be the same. Which is the situation – unless your iPhone gets thrown into a pizza, which makes the microphone read differently than the day before – you will get a consistent reading. Which means that we can measure the speakers consistently, and tell if there is something different from day to day. When the sounds come from speakers, we can see their levels, mark them down and compare the results from last week and last month…all the way back to the time when the room was set up by a technician. Oh…and sometimes we will measure silence. A quick story about the term ‘dB’. And a quick hint. The person who is honored for his research in sound, and sound transmission across a distance (he was the first to get a telephone to work), is Alexander Graham Bell. That is why the ‘B’ is always capitalized. The ‘d’ is short for ‘deci’ meaning one tenth. Rarely do we use the term ‘Bel’ by itself. The typical measuring unit is the ‘decibel’. And finally. 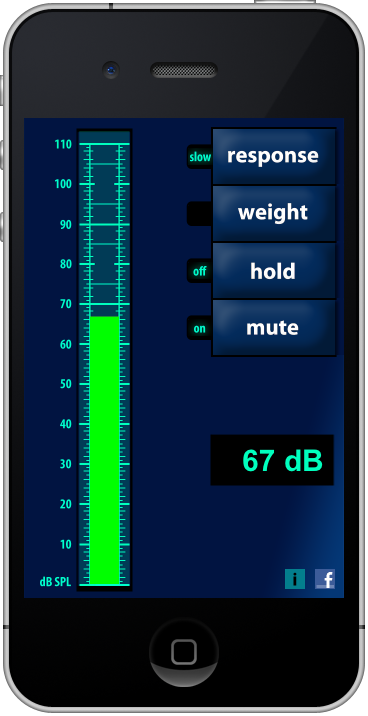 When you have finished measuring your auditoriums, turn off the dB Volume tool. It may stay running in the background. If so, it will cut your battery time. Go and do well. Practice a lot! …and mark up up those Manager’s WalkThrough Report forms.